Are you extremely sensitive to cold temperatures? Do you feel uncomfortably chilly when out on a cold day? If you find even mildly cold temperatures extremely difficult to bear, you may have cold intolerance. In cold intolerance, you might also experience sensitivity of cold in certain parts of your body – such as your fingers and toes. Cold intolerance can be a sign that your body is finding it hard to keep you warm. This could be due to your poor overall health or it could be a symptom of some underlying medical condition. Anemia occurs when your body does not have enough healthy red blood cells. There are many types of anemia. One of the most common forms of anemia are iron deficiency anemia. It is also the most common nutritional deficiency worldwide. According to a 2009 study conducted by the Public Health Nutrition, anemia affects one-quarter of the world’s population. Iron-deficiency anemia occurs when your body is low on iron. Iron helps in the production of red blood cells that carry oxygen to your tissues. If you do not have enough iron in your body, there will not be enough red blood cells to carry oxygen to your body. This impairs your blood circulation and can make you feel cold. Iron deficiency anemia rarely causes death, but the impact on human health is significant. Although anemia is mostly associated with a diet that is low on iron, folic acid or B12, this condition can also be caused by heavy blood loss during menstruation, pregnancy, ulcers, intestinal disorders, cancer, bleeding disorders and other chronic diseases. Anemia is a serious condition and needs to be treated. Your doctor might suggest you to take iron supplements. In addition to iron supplements, include foods rich in iron like red meat, green leafy veggies, eggs and sea food, beetroot, apple, pomegranate, blackstrap molasses. Your thyroid gland is located in your neck, just below your Adam’s apple. This gland produces thyroid hormones that regulate your metabolism, energy levels and heat production in your body. Your thyroid gland works as a thermostat that helps to regulate heat in your body. Hypothyroidism happens when your body does not produce enough thyroid hormone or you have an underactive thyroid gland. An underactive thyroid gland slows down your metabolism. As a result, your body temperature falls and you feel chilly. According to a 2007 study published in the Journal Thyroid, 3.7% of Americans suffer from hypothyroidism. This condition is highly prevalent in aging women. Feeling cold is one of the classic symptoms of hypothyroidism. Hypothyroid is mostly hereditary and is a life-time condition. There is no cure for it. Taking timely medication can help you control your condition. Malnutrition can be caused due to insufficient, excessive or imbalanced consumption of nutrients. You may be malnourished if your diet does not provide you with adequate calories and proteins for maintenance and growth. According to Food and Agriculture Organization (FAO), around 3 million people in UK suffer from malnutrition. Under normal circumstances, your body uses its energy reserves to keep your warm. But when you are malnourished, instead of regulating your body temperature, your body uses the energy reserves to enable the proper functioning of your vital organs. This explains why you feel cold when you are malnourished. Malnutrition can also be caused if your body suffers from conditions like celiac disease (gluten intolerance), ulcerative colitis (inflammation of large intestine), crohn’s disease (inflammation of digestive tract) and cystic fibrosis (affecting exocrine glands). These conditions prevent your body from digesting or absorbing your food properly. Obese people can also suffer from malnutrition. Obese individuals usually consume high fat and sugar diet that are low on vitamins and minerals. Malnourished individuals should consume at least 1.2 litres of fluid (about 6-8 glasses) per day. Eat nutritious foods like whole milk, peanut butter, nuts and seeds, whole-grain cerelas, oats, legumes, eggs, meat and fish. Poor blood circulation means insufficient amounts of blood reaching certain parts of your body, especially your hands and feet as they are extremes that are likely to receive less blood. When your blood is flowing at optimal speed, it helps to maintain your body heat. If you suffer from a poor blood circulation, your blood is not reaching all parts of your body and thus is unable to keep you warm. This explains the cold you feel in areas with a lot of nerve endings like your hands and feet. Often, circulation problems are a result of some underlying health conditions like Raynaud’s disease, atherosclerosis or high blood pressure. In Raynaud’s, your body restricts the blood flow to certain areas of your body, especially fingers or toes to feel cold and numb when exposed to cold temperatures or stress. While atherosclerosis causes hardening of the arteries by deposition of fatty material on artery walls, high blood pressure occurs when the force of blood against the arteries happens to be very high. Reducing risk factors like smoking, stress and obesity can help you control poor blood circulation problem. Anorexia is a serious life-threatening eating disorder where a desire to lose weight takes over everything else. People with this condition are worried about gaining weight and may obsessively diet and exercise, even to the point of starvation. According to a study published in Current Opinion in Psychiatry in 2006, the average prevalence rates for anorexia nervosa among young females are 0.3%. American Academy of Family Physicians states that eating disorders occur most in adolescents and young adults and are 10 times more common in females than in males. Body fat stores energy and help your body withstand cold. If you have too little body fat, your body will have difficulty maintaining the body heat. This will make you feel cold more often. Eating disorders are associated with devastating medical and psychological consequences, including death, osteoporosis, growth delay, and developmental delay. Peripheral neuropathy is a condition that is a result of damage to the peripheral nervous system that transmits information between your brain and the spinal cord. These nerves are responsible for sending message to the brain regarding temperature sensation. As these nerves are damaged, your hands and feet might end up being cold all the time. Although neuropathy may be painful, very few forms are fatal. The symptoms may vary depending on the nerves affected. Majority of the people suffer from multiple nerve damage. 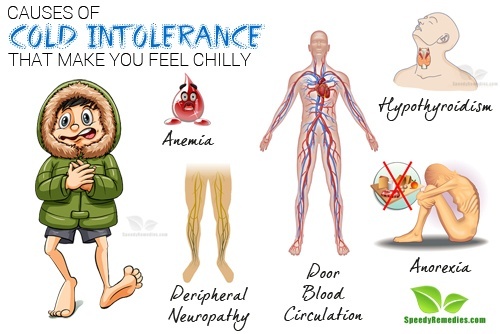 Cold intolerance can also be caused due to conditions like fibromyalgia, hypoglycemia and hypothalamus disorder. The skin that has been previously injured, such as by frostbite, may also remain sensitive to cold even after the injury has healed. Failure to seek medical help can sometimes lead to serious complications. Consult your doctor for to diagnose the underlying cause.